In a world where love means nothing, Nintendo still managed to capture our adoration with Mario Tennis Aces, Shacknews's choice for Best Sports Game of 2018. It's not always easy to get the gaming community at large to go out and buy a sports game. The common big-name franchises are able to keep core fans consistently engaged, but they don't offer many titles that speak to the general gaming public. That's why it's so easy to get caught up in a game like Mario Tennis Aces. It gives players the chance to play real-world sports in the sort of creative setting that only Nintendo can deliver. Not only is it packed with the company's most memorable characters, it's a solid tennis game with enough depth to satisfy solo gamers and group players alike. Marking the eighth installment in the Mario Tennis series, Aces is a Switch exclusive title that allows tennis fans to play a couple matches in all those places where the hybrid handheld tends to tag along. Nintendo pulled out all the signature tricks in the latest release, which sees the return of the popular single-player Adventure Mode, packs in a starting roster of 16 characters, and shakes things up with racket-based puzzles and several multiplayer modes. Donkey Kong is about to get served. Of course, the Big N didn't just throw in Mario and Luigi and call it a day. 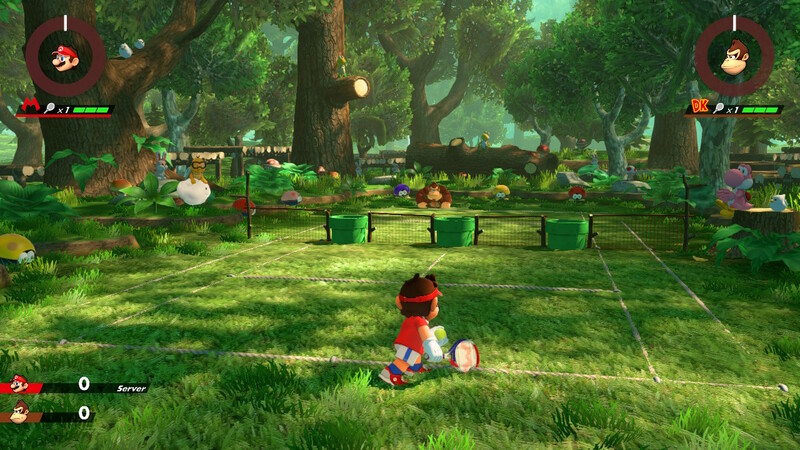 The development team made sure that Mario Tennis Aces had enough to offer casual players and tennis fans alike. The series has long been known for its arcade-style action, but for the latest release, Nintendo came up with a few ways to keep things interesting. A selection of different play styles were made available to help narrow down specific strategies, giving players a chance to focus their attention on speed, recovery, court control, or even general power. Special and Charged shots also made their way into the mix, helping to level the playing field between players with opposing strategies. Beyond being an excellent tennis game or an excellent Nintendo game, Mario Tennis Aces is also an excellent Switch game. Finding software that puts the company's handheld console to proper use is a rare thing, and it's no surprise to see the system at its best in the hands of the crew that created it. Visuals look lush and vibrant in handheld mode or connected to a TV, and players who enjoy making use of motion controls can enable Swing Mode to get closer to the sensation of playing actual tennis. Even so, the Switch's portability is the real highlight, allowing the game to be enjoyed during travel or times when players are away from their PCs. "Should you pick up Mario Tennis Aces? If the answer wasn't immediately obvious already, that's a resounding yes. It's the best the series has seen in years, and that's saying something for this tennis fan. If you're looking for one of the best sports games the Switch has to offer, look no further. You've found it." Don't miss out on the biggest games of the year: head over to Shacknews' Game of the Year 2018 home page to learn about all of our favorite titles from the last twelve months. Beyond that, gear up for the hits coming next year with our video game release date schedule for 2019. Love this game, they've improved upon it quite a bit since launch. It is so damn good! The number of updates has been crazy, they've been directly addressing every complaint since launch. I just wish I had more time to play it, too many games (and Smash)! I wish there were more sports games not made by EA. I miss NBA Jam, Tecmo Bowl, Double Dribble, Blades of Steel, etc.